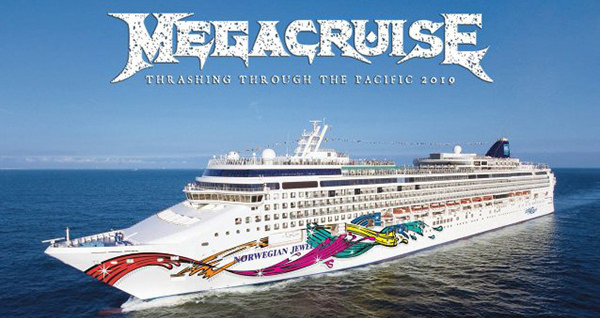 Megadeth's first-ever Megacruise will commence next October and also feature Anthrax, Testament, and Devildriver, among others. The NCL Jewel will set sail on October 13, 2019 from Los Angeles, California and dock in San Diego, California and Ensenada, Mexico before returning on October 18, 2019. Megadeth mastermind Dave Mustaine had this to say via Full Metal Jackie's: "We've got a lot of really great bands that we've planned. One I'm super excited about is Armored Saint. I've always been a fan of Armored Saint. Of course, they're not headlining — there's several other bands that are above them on the bill — but they're there. And I like Armored Saint a lot. I like the Sandoval brothers and love Joey [Vera]. So, I think it's gonna be fun. And that's what we wanted — we wanted something that people would stop thinking about, 'How do we have the most successful this? ', and, 'How do we make the most money that?' Well, how about you treat the fans with dignity and respect and you give them their money's worth, you know?"